Our Services - Mann Refrigeration - Full HVAC & More! We are proud to offer a wide range of services, including full HVAC & more, performed by professionally-trained and certified technicians, designed to meet every customers’ home comfort needs exactly. Air Conditioning (A/C) Cooling Compressors and Repairs – Mann Refrigeration Heating and Air can provide installation, service and maintenance to virtually all the components which make up your air conditioning system, including service to air conditioning compressors, outdoor fan motors, fuses, filters, drains and more. Central Air Conditioning Systems – We offer Air Conditioning System Design, Maintenance, Repair, Sales and Installation Services. Our HVACR (Heating, Ventilation, Air Conditioning and Refrigeration) technicians can provide maintenance and service to all types of air conditioning and commercial refrigeration systems. Our commercial and residential AC repair and installation services are available throughout our coverage area. Duck Work – We install round, spiral and rectangular metal and flex duct work in residential and commercial applications. Indoor Air Quality Control – A healthy home starts with clean, healthy air. Learn more about our quality control solutions by clicking appropriate link to the left. Solar Solutions – View Solar Solutions to Learn how you can cut utility costs. Thermostat Repairs, Services and Installs – Including WiFi Thermostats. Your thermostat is the device that regulates the temperature of a system so that the system’s temperature is maintained near a desired set point temperature. A properly installed and serviced thermostat can not only provide you with comfort, but save you money as well. 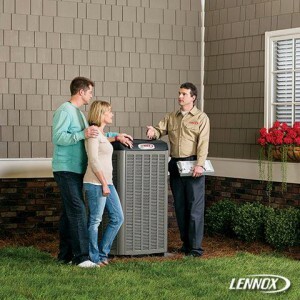 Lennox – The Leader in Home Heating and Cooling. A Premier Lennox Dealer offering a wide selection of Lennox air conditioning and heating products (including heat pumps). Learn more about the products available by clicking the “Our Products” tab at the top. Covering Alvord, Boyd, Bridgeport, Chico, Decatur, Paradise, Newark, Rhome and all of Wise County. In addition, our service area includes the following counties in Texas: Montague, Jack, Tarrant, Denton, Parker, Young, Wise, Palo Pinto, Hood and Clay Counties. For more information and to discuss your individual needs, call (940) 683-6266.